Kale Hannahs, and Gonzo Gonzalez. MANY DIFFERENCES may exist between various types of Hawaiian and contemporary island music bands, but the two things that unite them all are microphones and amplifiers. Think about it for a minute. When was the last time you saw a local group perform without a sound system? Well, it'll be happening this weekend as the RM Towill Corporation presents the 19th annual Ka Himeni Ana Hawaiian song contest tomorrow night at the Hawaii Theatre. Never heard of it? Ka Himeni Ana has not been as aggressively promoted in years past as some of the other annual music contests, but it rates as a major annual event in Hawaiian music. Created by Richard M. Towill in 1983, Ka Himeni Ana showcases the talents of local musicians as they compete for nominal cash prizes, performing traditional nahenahe (soft and sweet) Hawaiian-language songs without electric amplification of voices or instruments. The instruments are restricted to ukulele, guitar, acoustic bass, autoharp, steel guitar (which may be amplified) and any of the instruments used by Hawaiians prior to 1778. Other rules specify that the group must consist of no fewer than two or more than five singers, with at least half the singers playing an instrument, and no soloists are allowed. Keola Beamer will be the master of ceremonies. Haunani Apoliona will be honored for her contributions as a Hawaiian musician and community leader. "It all started with a company party," contest spokeswoman Marge Hansen said. "The musicians put up the volume so loud that our guests were not able to communicate with each other. I think all of the parties you go to, you notice that it's still true today." Hansen and her husband were at the Ilikai one night and heard some guys singing on the beach without any sound equipment. She mentioned the experience to Towill and he decided to sponsor a contest that would encourage interest in traditional unamplified Hawaiian music. Ka Himeni Ana was the result. The contest didn't get much public notice in the early years, but the subsequent word-of-mouth eventually resulted in bigger crowds than the original venue could handle. Hansen says they considered making it a two-night event but decided it would be too hard on the contestants and tax the slender amount of resources they had to work with. "A lot of people still don't know about us," she said. "Most of the contestants we get come from the Hawaiian community that reads the OHA newspaper or still by word-of-mouth." Ka Himeni Ana hasn't lacked for talented competitors. Among the winners in years past are Pai'ea (1999), 'Ale'a (1998), Kanilau (1995) and the Kanele'a Connection (1993). 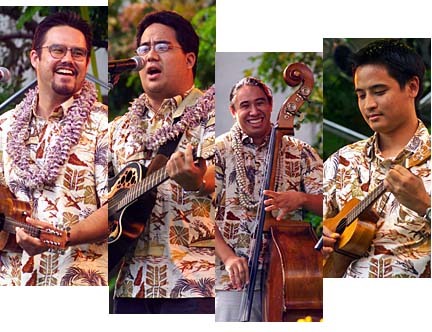 Del Beazley, Chris Kamaka and Ku'uipo Kumukahi teamed up in 1998 to win as a trio, and a male quartet (including Kamaka), who would later become Hoku Award-winners Ho'okena, took top honors as Kipona Leo Hawai'i in 1986. Hansen says that after 19 years, Ka Himeni Ana is still both a labor of love and "a lot of hard work." "Richard Towill and his son Ricky work very hard just getting all the ginger (for the stage decorations), but we've had some amazing groups (and) the theater's acoustics are great. When the curtain goes up, it's all worth it."